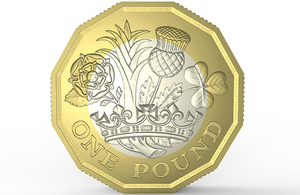 What will the new pound coin mean for fruit machine hire? The UK is preparing for a move to a 12-sided £1 coin, with a ‘tails’ side designed by 15-year-old David Pearce and unveiled in mid-March, but what are the implications for fruit machine hire? Well the good news is that your fruit machine rental provider will handle the transition – new machines will eventually be made for the new shape of coin, and old ones can usually be recalibrated to support it too. The same applies to other coin-operated gaming machines, from quiz machines to pub pool tables, and there’s still plenty of time to get recalibration completed before the new coins enter circulation. But there’s also another possible impact that could be good news for fruit machine hire customers immediately following the launch of the new coin. Often when coins change shape or size, there’s a sense of unfamiliarity with the new coin – and that’s good for fruit machine rental customers. Most modern machines now accept notes too, and we could see an increase in players paying with £5 or £10 at a time, rather than using the unusually shaped pound coins – with the potential to boost takings substantially as a result.